The daily challenges give you fun ideas for what to draw! This can be useful if you're in the mood for sketching but drawing a blank on what to do. You can find the challenge each day at the top of the SketchClub home page. Today's challenge is . So once you see what the challenge is, hop back to your canvas, start a fresh new sketch, and create something on the challenge topic. When you're done upload your sketch to SketchClub and once it's posted you'll see the option to enter it in the challenge. 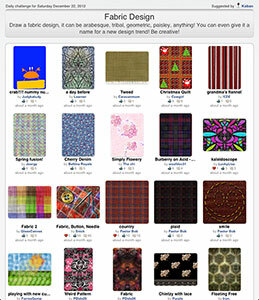 On the challenge page you can view all the other entries by other artists. It's fun to see everyone's different take on the theme each day! On the Challenges page you can view past challenges as well as suggest ideas for future challenges! When you idea is used you get some bonus glops too!